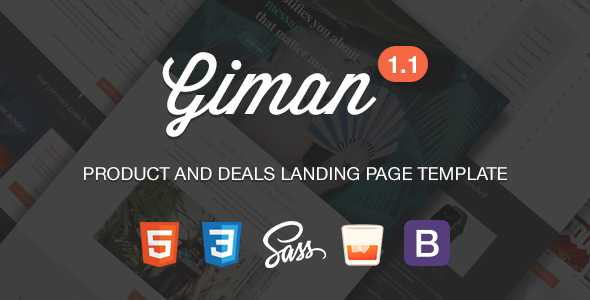 Giman is a HTML landing page template which perfect for product showcase, campaign or promotion purpose and also good for offering deals or bundle. Giman has a lot of features and elements that you can even create multipurpose website using this template. Save tons of money, right? Giman has 4 layout variations, they are Single Product, Product Campaign, Game Deals, and Digital Bundle layout. Each has specific purpose but completely flexible. You will get unique elements on each layout. You can use any of them, place it anywhere, customize it easily and run your project. This template is suitable for everyone, whether you?re a user with zero programming skills or an advanced developer you will love this template because Giman built with the famous Bootstrap framework (latest version) and polished with Sass. With Giman landing page template you can sell and manage your product online even easier. Giman is now compatible with major e-commerce platform like Sellfy and Selz. The steps to begin selling your products is just like upload your product – embed to your website – get earns! Documentation file. See the online version here. If you have any question before take further step to buy this item, or if you want to get support of your purchase. Please contact me using the contact form on my profile page or Item support tab here, or just drop your comment here. You can also email me directly to: xwisnux@worksofwisnu.com. That’s weird, I usually reply email within 24 hours, if you still not getting my answer please check your spam box as well. That hurt, but sometime email just went there. Beside using email, you can also contact me on my social media profile: Facebook and Twitter. I’d love to get social with you. The images used in the preview are not included. Credits are on the documentation. Special thanks to Ringly that have allowed me to use their assets for demo purpose. Seriously, You guys have a great product! - Add compatibility to Selz and Sellfy e-commerce platform.